In four months since the "Dream With Me Tonight" CD was released it has earned two awards, a ‘Parents’ Choice Award’, and a ‘ Best Toddler CD award’. It is extremely easy to figure out how this CD has managed to do this! All you need to do is sit back with your children and listen to the wonderful, soothing music. Since receiving my copy for reviewing, my children, ages six & eight, have requested that we play it for them at bedtime. These beautiful lullabies have lulled my older children to sleep, and are loved by my daycare children, ages 14 weeks to nine years, as well. More important, this CD will be loved and cherished by the parents and grandparents, who are tired of listening to the typical, quick, loud music available for children these days. Extremely well written by Lanny Sherwin, and beautifully vocalized by Melodie Crittenden, these songs are going to be a hit in any household. My husband and I fell in love with these catchy, yet calm tunes since we first heard the songs playing. 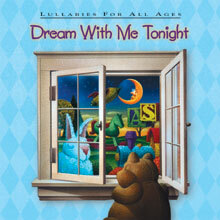 Different from regular lullaby songs we are all familiar with, "Dream With Me Tonight" has done its homework and should receive an A+ for producing a CD that will be enjoyed by a wide variety of ages and cultures. My favorites on this CD are "Dream With Me Tonight," "Too Many Animals," "It’s Not Fair," and "Snuggle You." All of the songs on the CD are remarkable pieces of art, and I would not be surprised if I never find another children’s CD that could compare to the quality of this one. Loaded with 15 songs, 10 with vocals and the remaining five being instrumental, this would be a wise and thoroughly enjoyed investment for any parent, grandparent, aunt or uncle to purchase. Guaranteed to be loved by all, no matter how often you listen to it, or how old or young you are, I recommend ordering your copy today, you will not be disappointed! Dream with me tonight will be donating 10% of all sales of the CD “Dream With Me Tonight” to the SBAA. (Spina Bifida Association of America) Their donation is helping to achieve a very realistic dream of reducing the numbers of people afflicted with this disabling birth defect.